Confess — unless you’re Asian, you don’t know what a tiffin is, do you? Confession — neither did we. A Scottish cake that’s not baked. All of the abo — yes, of course; 4’s the right answer. But in San Francisco, 3 is righter still. 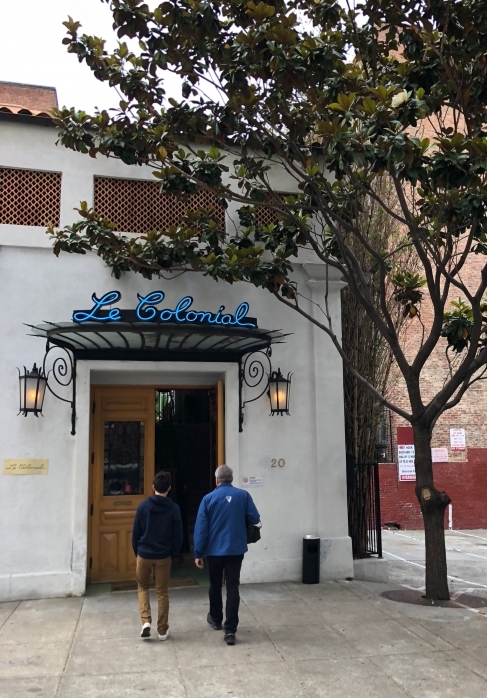 Since June, 2018, Le Colonial(see that entry) has been serving Sunday night tiffin dinners. In this French-accented Vietnamese restaurant, tiffin is another way of saying family-style. Here’s how it works. You’re handed a menu, from which the table must choose Tiffin Dinner 1 (three tiers, $19 per person) or 2 (four tiers, $29 per person). Then —and here’s where it gets tricky — all tablemates have to agree on one course from each tier. Spring rolls or crab cake. Curry shrimp or lemongrass chicken. Garlic noodles or fried rice. And so forth. Agreement reached, food ordered, and a few minutes later, the waiter appears, carrying a stack of round, stainless steel containers. He deconstructs them and passes them around the table. We chose the coconut-crusted crab cake, jumbo shrimp curry, wok-fried jasmine rice and green beans with shitake mushroom garlic oyster sauce. Followed by, for six dollars, a flourless cake dessert. Delicious. All delicious. And served in the tropical, old Vietnam, wicker chairs and ceiling fans that is Le Colonial, a San Francisco gem.